1995 is an excellent vintage for red Bordeaux, the most consistently successful since 1990. France suffered through September rain for the fifth consecutive year, but this time the rain came just before or at the beginning of the harvest and then mercifully stopped; actual rainfall was significantly less than that of '93, and somewhat less than '94. 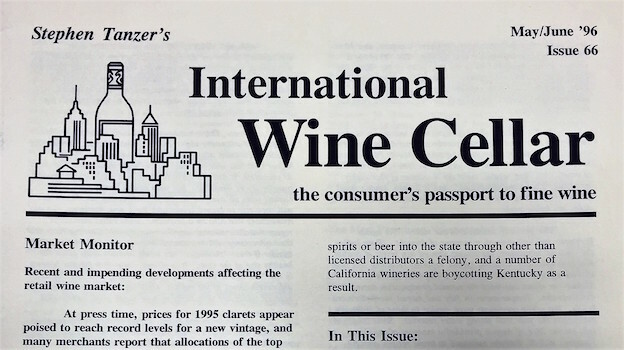 My early tastings in late March turned up a host of '95s worth buying, though high prices somewhat temper my enthusiasm. 1995 is a very good example of a ripe-but-not- overripe vintage. The wines have good density, low acidity, and strong but generally ripe tannins; they appear to be best suited for medium-term consumption by Bordeaux standards with peak drinkability from 5 to 15 years after the vintage for the lesser examples, and 10 to 25 years for clarets from the best terroirs. But '95 is not a vintage in the class of 1990 or the best years of the '80s. The high points of 1995 are perhaps not as high as I had hoped to find; very few wines have the intensity and depth of flavor, palate-staining extract, and grip of the best examples from the truly great years. In the Médoc, where ripe cabernet was picked under sunny skies, the wines are consistently successful, and a number of outstanding wines were made. Performance in Pomerol and St. Émilion is more mixed: at some properties I preferred '95, at others '94. But, again, there are a number of thoroughly satisfying '95s on the right bank. And it is here, among small and ambitious properties, that some of Bordeaux's most exciting wines are being made. The growing season and the wines. Yet again Bordeaux suffered through a summer of drought. (Even before the rains of September, the grapes showed low levels of acidity and high tannins.) Château Latour reported receiving less than an inch of rain in June, and about a half-inch apiece in July and August—or about one-third the normal precipitation during these three months. Temperatures in July and August reached record levels. But while conditions were similar to those of 1976, the soil began the year with strong water reserves. Some localized rain on the 23rd of August provided a measure of relief in Pauillac, and St. Estèphe managed to avoid serious drought stress as a result of its more humid, clay-rich soils. St. Julien was particularly affected by the drought, yields here averaged 20% lower than those of nearby Pauillac. But as my tasting notes will show, fears about the quality of wine in St. Julien proved to be unfounded. Some rain fell during the September 6-12 period, and some Médoc estates began picking merlot from precocious soils on the 11th or 12th. But rain fell again between September 14 and 19; merlot picked at the end of and just following this period generally came in in decent condition, but with lower sugars and even lower acidity than expected. The very latest picked merlot was generally fuller and firmer. Most cabernet sauvignon in the Médoc was picked in the nine or ten days beginning September 25 under ideal dry conditions. Indeed, 1995 saw the ripest cabernet in Bordeaux since 1990. Relatively little chaptalization was needed, polyphenol levels were high, and tannins generally show little greenness. The red Graves as well as the whites are less consistent, as the rains made harvesting more of an adventure on these earlier-ripening soils. My opportunity to take an early look at approximate blends of 16 or so Sauternes and Barsacs, made possible by Bill Blatch of Vintex, revealed that '95 will be the best vintage for Bordeaux's sweet wines since 1990, but I tasted nothing to suggest that '95 will approach the 1988-90 trio of vintages. On the right bank, many properties harvested excellent cabernet franc that has contributed structure to their wines, and merlot was generally ripe and soft. But here there was heavy localized rainfall on September 7th (more than one proprietor reported receiving nearly four inches of rain in a matter of hours), and it is clear that this precipitation has resulted in a degree of dilution in some wines. Although yields in '95 were healthy (and often considerably higher on the right bank than were anticipated just a couple of weeks before the harvest), they were rarely excessive at the top châteaux, where crop thinning is now a matter course. Most of the best Bordeaux properties have higher standards than ever before when it comes to selecting lots for inclusion in their grand vin. In the attached notes, I have presented my thoughts on '95s and '94s, most of which were tasted at the various properties during the last week of March. Additional background information is provided for most of the estates I visited this spring. My notes and projected scores should be regarded as preliminary in nature, as late March is very early to be tasting the young vintage. While many final assemblages had already been made, some châteaux hold off on their final decisions until later in the spring.